This weekend as I was buying dental chews for our dogs, I had a revelation. Poopbags.com had, without my intention, made me a loyal customer. When I shop online for things like dental chews, I go to Google, type in the product I’m looking for, and shop by price. That’s what I was doing Saturday. In the past I have bought chews and toys from many different online vendors. Each seller has been reliable and has delivered the purchases quickly and without a problem. Despite my good experiences, I feel no loyalty to the different sites. Each time when I want a specific product, I Google it, and buy from the least expensive store. Googling, comparing, and buying is what I do. And, then I went to purchase more disposal bags for the dogs. I just typed in www.poopbags.com and bought a three-month supply. Why do I act differently when I need to restock biodegradable “plastic” bags for our dogs? I know that there are many sites that sell them — when I first decided to buy them online I sorted through a raft of competing sites. But, I don’t Google and price shop for refills. I just go to Poopbags.com. I mulled my inconsistent behavior. I figured out that the reason I go to Poopbags.com is that they send me regular newsy updates about what they’re stocking, what canine charities they’re supporting, how their own dogs are doing, and other chatty stuff. I feel like I know the owner, even though we’ve never met. Not only that, but their monthly (or so) email newsletter keeps their name in my mind. Okay, their in-your-face name makes it unlikely that I am going to forget their name. But, the point is I think of them as “my” supplier because they send me fun information frequently. Their communications are not really sales tools, but marketing. That is, I don’t think I’ve immediately bought more bags when I’ve gotten one of their emails, but I am sure that a few of the messages have gotten me to review the supply downstairs to see if was time to order more. If you’re not making clients think of you as their supplier, take a lesson from Poopbags.com. Start sending them bits of fun facts, specials, and information on a regular basis. Start up — and maintain — an electronic newsletter. Yes, an electronic newsletter will work in your industry. 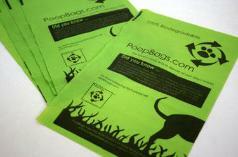 I mean, is there any more unlikely field of commerce for an electronic newsletter than Poopbags.com’s? I use Constant Contact as the newsletter service for most of my clients. They have excellent, US-based telephone support and have been reliable and mostly trouble-free for years. Constant Contact allows you to send unlimited email to people on your mailing list. They charge by the size of your list, and most of my clients are paying $30 a month. VerticalResponse is another good emailing service. They charge for each individual email message sent out, and they are much more economical if you send to a lot of email addresses infrequently. Either Constant Contact or VerticalResponse are fine choices to get you started becoming your clients’ favorite business. You won’t go wrong with either… the only mistake you can make is to poop out and fail to set up regular email communications to clients. Really, if Poopbags.com can disrupt my Googling pattern and get me to go directly to them, imagine how your newsletter will help you with your clients.